PLEASE FILL OUT THIS FORM FOR BOATS NEEDING MAINTENANCE. Recently we've made some updates and upgrades to our fleet. Some of these changes have been in effect for a while now, others such as cleaning the boats will be enforced after July 4th. First you will notice that each boat now has an electronic lockbox. Every member also has their own personal lockbox code. DO NOT share your code with anyone, if someone else uses your code you will be held responsible for any damages. These codes allow us to track who used a boat at exactly what time. They will also help us enforce the Why Buy rules - such as cleaning the boats after each use. You can find your personal lockbox code on the red line for Why Buy Confirmation emails. It is also imperative that when you fill up the gas tanks, you add oil to the can. The mix should be 50/1 Gasoline/Oil. This means in our 3 Gallon tanks you need to add about 8 ounces of oil. We also have tiller extensions available for use. You will need to pay a deposit in order to sign these out as they are quite expensive. With the introduction of these lockboxes we will be enforcing the rules more strictly. Boats should be cleaned afer each session. If there is a problem with a boat it should be reported immediately. We have set up a boat reporting form here. It can also be accessed from the Why Buy Confirmation emails. You can also view the maintenance log to see which boats have been fixed (they will be highlighted in green) and which boats still need maintenance. We realize that the boats haven't been maintained to the best standards over the past 20 years and we appreciate your help with making our fleet last another 20 years! Enter your code (including Stars **), and then press enter. It is a good idea to press 'enter' a few times to clear out any remaining memory from the person before entering your own code. 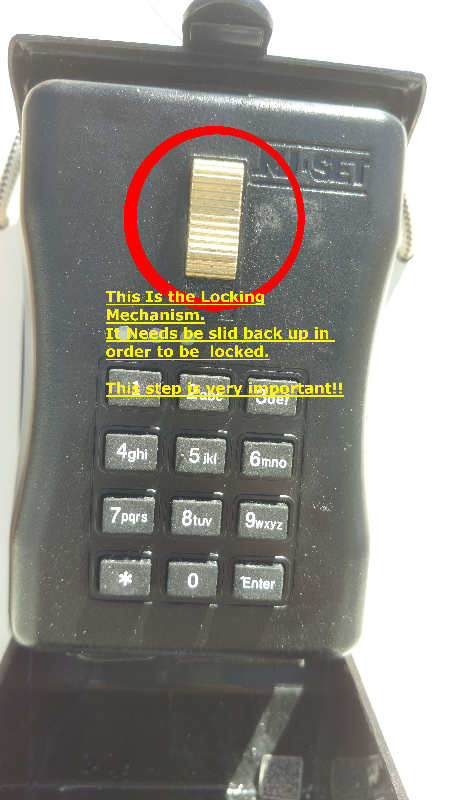 After you have pressed enter you should unlock the lock by sliding the gold mechanism down. Please make sure that you slide the gold lever back up into the locked position before leaving the boat. Lastly make sure you slide the key back into the boat, do not wrap the metal cord inside the box.